Not sure what to get your loved one for the holidays this year? How does a free Galaxy Tab 10.1 sound? A source at Rogers sent us over the above document this morning explaining how you can get a free Samsung Galaxy Tab 10.1 from the Canadian carrier. The deal seems pretty straightforward and boils down to you needing to activate two new lines of service on the Family Voice & Data plans. If you activate two new lines on the plan you will get a tablet for free in time for the holidays, and this applies to new customers, existing Family account holders and those who wish to migrate from a single line plan. If you still wish to partake, but just can’t think of any reason why you would need two lines, there is an option. If you add one new line to your existing Family plan, or if you migrate from a single line, you can pick up the same tablet for $149.99. While not free, it’s still a pretty sweet deal, and probably better than you will find it in any retail store. Of course you’re locking yourself into a lengthy contract to score yourself a free tablet, but as promotions go, this one isn’t exactly a bad one. For those of you up North, you can expect to see this promotion kick off on November 8. 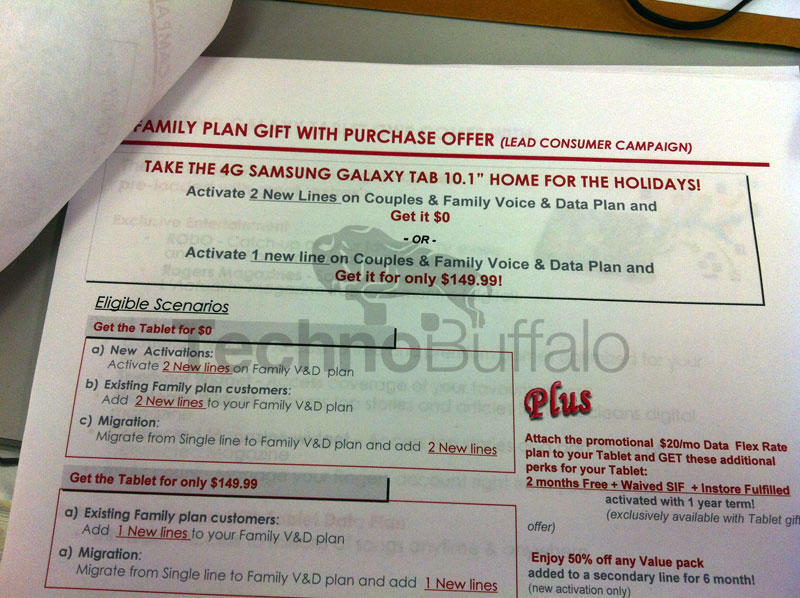 Are you tempted to sign up for the plan to get a free Galaxy Tab 10.1? UPDATE: Our tipster contacted us and let us know that the plan is for one year at $20 a month for the 500MB Flex Plan.